Anyone can start a blog—and I’m sure you’ve stumbled across a few never-updated, totally self-indulgent blogs in your day if you spend any time at all on the internet. So, if anyone can start a blog, how do you make sure that your yoga blog not only gets read, but also makes a difference? There are so many fascinating facets of yoga, so many lessons, so many teachings, it can be really overwhelming when you sit down to write a concise, informative and dare-I-say enjoyable post for your blog readers. If you’re thinking about starting a blog, or currently have a blog that needs some TLC, these strategies below are for you! This is a common mistake that I see on tons of blogs out there: super knowledgeable yogis with so much wisdom write on such an elevated level that they totally lose their audience (i.e. their students). Whenever you write a blog post, write it for your students. Think about how you would explain it to them, what language you would use, what metaphors you would employ and what morsels of wisdom you would pass along. Make it digestible, readable and easy to understand. Cover topics that you’re commonly asked questions about, and talk about the basics, like what namaste means, the benefits of ujjayi breath or what the deal is with om-ing. Consistency is key with blog writing. Just like your yoga, it’s a practice, and you have to be ready to show up again and again and again. That said, you don’t have to write every day, or ever every week but you do have to consistently offer valuable content in order to make a difference with your unique yoga voice. I recommend blogging at least two times a month so that you always have fresh content on your blog. Once you decide on your frequency, put it on your calendar so that you hold yourself accountable. Once you have content on your blog, don’t just let it sit there waiting to be found—get it out to your students, fans, and followers. Email a copy of the post to your email list, post a link to it on Facebook or share a link on Twitter. Get your blog post into the hands of anyone you think could benefit, and when you do, encourage them to pass it on to anyone else who would find it valuable too! To grow your blog following you have to reach new readers. A great way to do that is to share your expertise on other blogs. 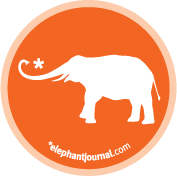 There are tons of super popular blog sites (like elephant journal—wink, wink, nudge, nudge) out there that are hungry for great content, so do them a favor and share your wisdom. Plus, when you guest post on other sites, you’ll be able to end your post with a brief author bio (see mine below) that can tell readers where to find you if they like what you’ve said. If you want to make a difference in the yoga world, you have to make your yoga voice heard. A blog is a fun, easy, effective way to share your yogic mission with the world. Ready to turn your yoga teaching hobby into a career? Cailen Ascher is a yoga teacher and entrepreneur who shares empowering business practices for yoga teachers at www.CALMbiz.com. To get a copy of Cailen’s 18-page Yoga Biz Essentials e-book for FREE, click here. Loving this article? Sign up for Cailen’s FREE newsletter, like Cailen’s CALM Biz Facebook Page, or follow her on Twitter. Good work! Thanks for such interesting stuff as I had been able to discover here. I agree with much of what’s written the following and I will be returning to this site again.